A girl named Duck - or rather, a duck who wants to become a girl - falls in love with a prince. 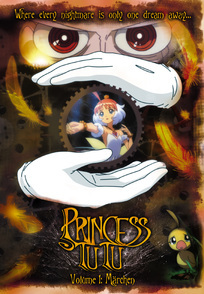 One day, a bizarre old man emerges and gives her a magical pendant that transforms her into the waltzing Princess Tutu. Now she must choose - for those who accept their fate find happiness, those who defy it, glory. This DVD features a reversible cover. DVD Features: Staff Commentary with Shoko Oono (Translator) & Mike Yantosca (ADR Writer); Voice Actor Commentary with Luci Christian (Duck) & Chris Patton (Fakir); Clean Opening Animation; Clean Closing Animation; ADR Outtakes; Etude; Ballet for Beginners; In the Studio; and Previews.